Decorative sugars are pretty much food glitter and do a great job at adding some playful sparkle to all manner of desserts. But they can be a bit pricey. Sold mostly in gourmet shops, a shimmering, little 2-ounce bottle can cost over $3 – – that works out to a whopping $25 a pound! For sugar! And the colors available… they’re usually limited to standard fare: red, green, yellow. I’m a bit embarrassed to say that in the past, I’ve spent a fair amount of money on interesting color combinations. But they’re so easy to make right at home. At home? YES, at home. I know… who knew?! And for mere pennies. Now that’s the proverbial sweet deal. I’m about to show you how to make… fuchsia! Periwinkle! Even tangerine and sea green! Or how about Wisteria, Donegal Tweed, Sunburn? Oh, the joyful jumbles you’ll soon be sprinkling on your cupcakes. Package them in, get this: small saltshakers – you’ll have a gorgeous gift for your foodie friends, or be happy displaying them right on your kitchen counter. Measure out the sugar you’ll need for each color – – usually 1/4 cup or less. Add food coloring. Begin with a small amount, just a drop at a time. You can always add more color if a deeper hue is desired. If you’ve added a large amount of liquid color, you may need to dry the sugar so it doesn’t clump before packaging. Sprinkle the colored sugar on a foil-covered cookie sheet and place in the oven at 200 degrees for five to ten minutes, until sugar is completely dry. If you’re using saltshakers to store your new sugar, make sure they have holes large enough for the sugar crystals to fit through. If not, you may have to drill or file larger diameter holes. 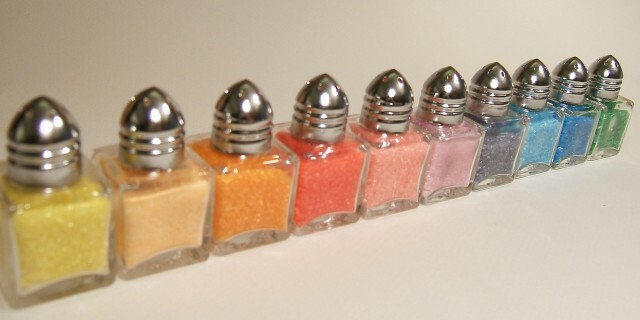 Small saltshakers can be purchased in bulk at restaurant supply stores. Using a funnel, pour sugar into shakers. Alternatively, store in ziplock bags. Once mixed and dried, you can also combine 2 or 3 colors to create a fanciful blend. Orange, red and gold become your “Sunset” collection, blue, green and purple might be your “Cool” blend. What colors would make up a “Zany” “Sweet Nothings” or “Serene” combination? Place an array of sugars in shakers on a small plate & wrap up as a gourmet gift for a foodie, or use at your next cookie decorating party. These are sure to please the eyes and satisfy any sweet tooth. And if that isn’t enough to bring a smile to your face, just think of all the money you saved making colored sugars at home. Yes, you. You made that, all by yourself! Celebrate with a cookie.